This afternoon I went to my first running class at Mile High Run Club and it was an awesome experience! These frigged temperatures are not exactly my ideal outdoor running weather. I am running my 5th half marathon, the Brooklyn Half Marathon in mid May and I’m thinking of running one before then, so I think it’s time I get back on the ball with my running. This class was exactly what I needed to beat my winter running blues. 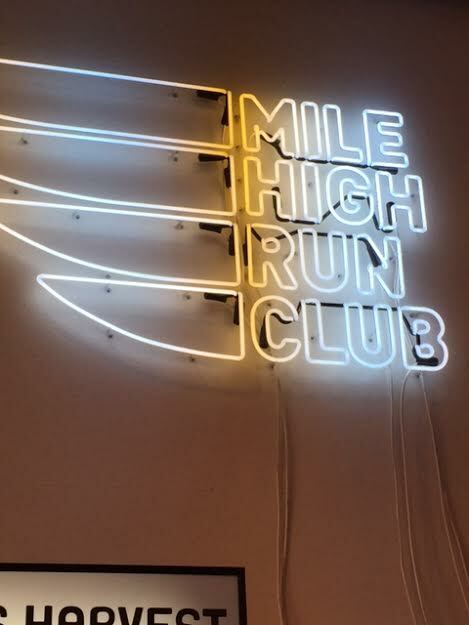 I had first heard about Mile High Run Club on instagram, then I looked up their website and found that they offer two types of classes. One is called the Distance and the other is DASH 28 (which is the one I took) , it is a 28 minute run complete with hills,speed training and technique cues from the teacher. 1o minutes of the class is spent with kettle bells (one of my personal favorite pieces of equipment to workout with). Squats, presses, curls, abs. This 45 minute class which was timed to a T was jam packed with everything you could want in a fitness class. 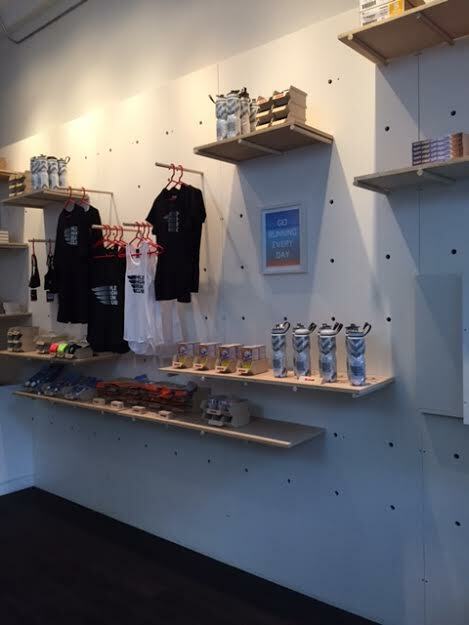 The gym itself is sleek looking and the staff is very nice. Since it was my first time there one of the receptionist gave me a quick tour of the facility, which I thought this was a nice touch. After placing my stuff in a locker I went into the studio to my assigned treadmill which you can choose when you book the class online. The studio holds around 30-40 treadmills. When you get to your treadmill there is a towel already waiting for you. And a card that helps show you the different levels you should be on during the class. It was very helpful and a great way to push myself a little further. The teacher was a great guy named Michael S. He is an Olympic runner and chef! (Running and food! Two of my favorite things). He walked around corrected peoples form used words of encouragement and great tunes too! 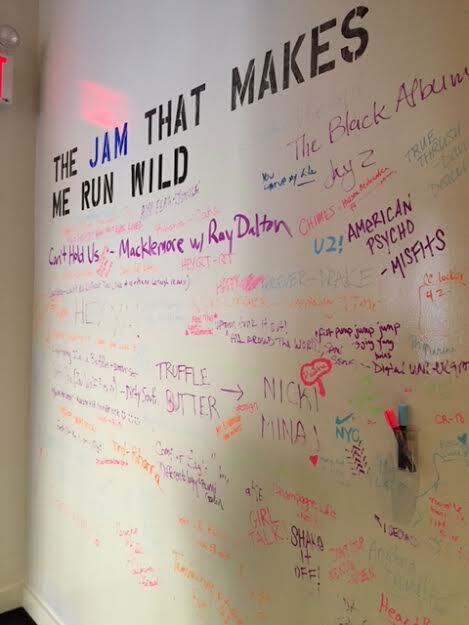 (They even have a wall where you can write the name of your fav song so that it can be played in one of the classes). The treadmills themselves are amazing! It is just a different breed of treadmill all together! It is sensitive to the touch. Where some treadmills you have to push constantly for the incline or speed to move this one is touch and go. The belt itself is amazing and rubbery as opposed to the normal belts that you see on treadmills. Which gave it a little bit more of an outdoor feel. The Kettle bell portion was a great way to make sure that a full body workout was done. Which is very important for runners. (Because I lift and run I notice a lot of runners don’t feel its necessary to lift weights especially legs! They think it is going to inhibit their running. But, this is so not true! If anything it helps protect your joints, and strengthens your muscles which will help improve your run time ). Thumbs up to them for incorporating into their Dash28 class. From start to finish it was an amazing experience. I can’t wait to try their Distance class which is a solid hour of running! Who’s coming with me?? Previous Post 9-5’s How to balance Work and Working out! Next Post Spark – A book review!